Big burger flavour in a mini burger format. 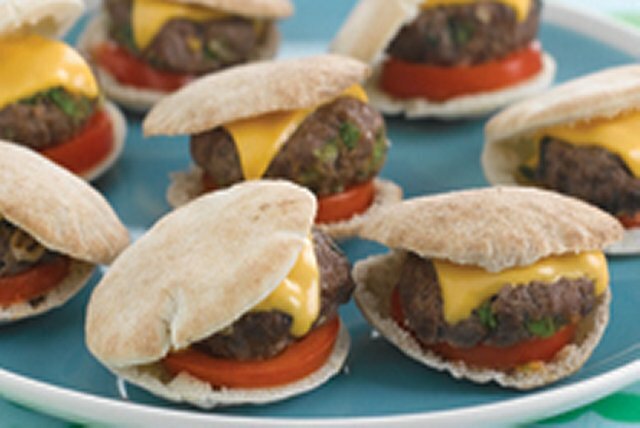 These Super Sliders come with sliced tomatoes and KRAFT SINGLES - a classic combination that is always a hit. Mix meat, barbecue sauce and onions; shape into 8 (1/2-inch-thick) patties. Broil 3 min. on each side or until done (160ºF). Cut pitas horizontally in half to open pockets, being careful to not cut through to opposite side of each. Spread insides of pockets with Miracle Whip; fill with tomatoes, burgers and Kraft Singles. Enjoy with a fruit salad and assorted cut-up fresh vegetables.